Business opportunities take shape with incredibly detailed 3D specialty items Choose Milk or Dark Chocolate. The 1oz Boot is Individually Cello Sealed. 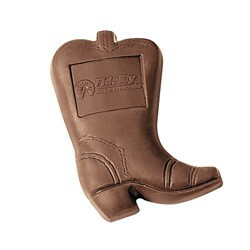 The imprint area on the 1 oz Boot is 1 1/8" X 7/8".